In 1948 the television industry in the Bay Area was born as people joined together to further the advancement of television as a profession. That same year the Academy of Television Arts and Sciences was organized in Los Angeles, and the first Emmy® Awards were held at the Hollywood Athletic Club on January 25, 1949. The Los Angeles Board of Governors voted unanimously to give chapter status to San Francisco on November 30, 1949. The first President was David M. Crandell of KGO. 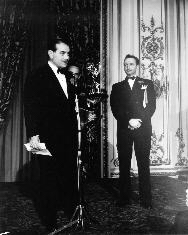 On March 24, 1950 the new Chapter’s first Emmy® Awards were held in the Gold Ballroom of the Fairmont Hotel; and Phil Lasky of KPIX, who had been selected the second President, received the Emmy® for Station Achievement. Actor Charles Ruggles was the emcee that night and Ben Alexander the announcer. Entertainment included Mindy Carson, Ella Mae Morse, Hogie Carmichael and the Tai Sing Dancers from Club Shanghai. 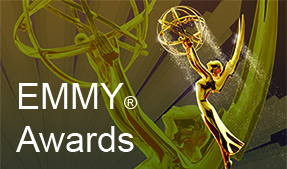 The second phase of this organization’s existence happened when the 4th Annual Emmy® Awards rolled around. By this time the Chapter had formed its own organization called the Northern California Academy of Television, and created its own statue. Then in 1956 talks began between New York, Los Angeles and San Francisco about the formation of The National Academy of Television Arts and Sciences. Seattle and Washington/Baltimore ultimately joined the fold and the new organization was born in 1957, but without San Francisco. 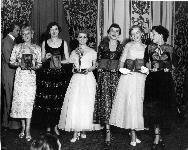 After the 1957 awards, the Northern California Academy of Television folded. 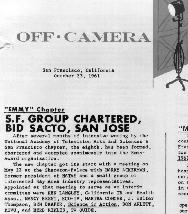 On May 22, 1961, a group of about 25 representatives of the local television scene met with Harry Ackerman, NATAS President and Gail Patrick Jackson, President of the Los Angeles Chapter in the Royal Suite of the Sheraton Palace Hotel to discuss the possible formation of a San Francisco Chapter of NATAS. The group was very positive, and decided to appoint an interim committee to set up the bylaws and procedures for this new Chapter. That committee consisted of Ken Langley, California TB and Health Association; Nancy Besst of KGO; Martha Conger, J. Walter Thompson; Ben Draper, “Science in Action;” Don Arlett, KTVU; and Herb Rickles of TV Guide. Florence Fowler, Vista Productions and Jack Armstrong of TV Guide sat in as honorary members. On July 28 at the Peacock Court of the Mark Hopkins Hotel, 200 members of the local TV industry were joined by a Hollywood contingent to determine interest and support. At a third meeting held on August 29th at the Press and Union League Club, headquarters for the new Chapter, an election committee was formed to nominate a Board of Governors. The following individuals were elected officers: Bill Hollenbeck, President; Ken Langley, 1st Vice-President and Trustee; Jim Baker, 2nd Vice-President; Martha Conger, Secretary and Nancy Besst, Treasurer. The third phase of our history happened when the National Trustees officially voted in the new Chapter on October 6, 1961. 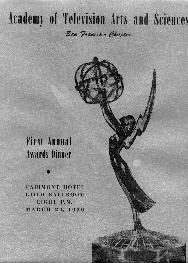 The first Emmy® Awards of the San Francisco Chapter were held on March 22, 1972 at the Peacock Court of the Hotel Mark Hopkins and honored programming broadcast in 1971. There was no Best News Award that first year. This Chapter devotes itself to preserving the history of television in Northern California, Hawaii and Reno, Nevada. Let us look forward to the future!